Infant clinical nutrition has witnessed considerable demand over the past few years. The robust expansion of the infant clinical nutrition business is mainly attributed to the rising gross household disposable incomes (GHDI) in developing economies such as China, India and Latin America, wherein birth rates are exhibiting a significant increase. Other factors contributing to demand for infant clinical nutrition include proliferation in number of young children having specific nutrition requirements, and hypo-allergenic formulas, along with the paradigm shift toward premium quality offerings. A new report of Persistence Market Research, titled “Infant Clinical Nutrition Market: Global Industry Analysis (2012-2016) & Forecast (2017-2026)”, offers detailed analysis on the infant clinical nutrition market on a global level. The report delivers actual data related to the market for the historical period (2012-2016) along with an estimated intelligence on the market for the forecast period (2017-2026). The information is presented in terms of value (US$ Mn). Macroeconomic indicators coupled with an outlook on the infant clinical nutrition demand pattern around the world have also been encompassed by the report. 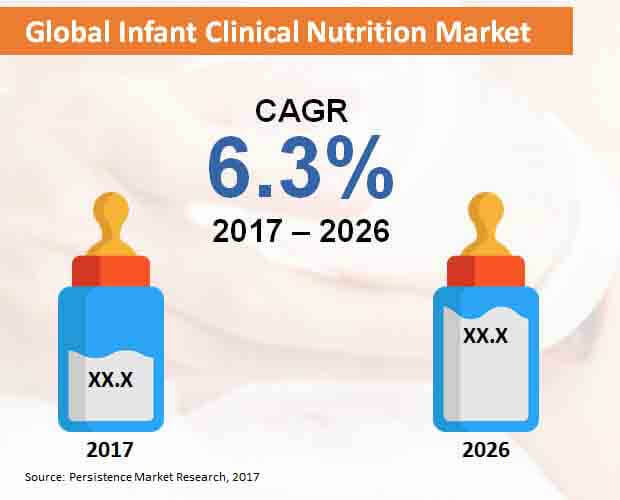 The report further imparts key drivers and restraints for the global infant clinical nutrition market, and their impact on regional segments included over the forecast period. The executive summary chapter, which initiates the report, offers key market dynamics and numbers associated with the global infant clinical nutrition market, along with key research findings related to the market segments comprised. The market numbers included in this chapter are a blend of compound annual growth rates, market shares, revenues, and volume sales. A concise introduction to the infant clinical nutrition market is offered in the chapter succeeding the executive summary, along with a formal definition of “infant clinical nutrition”. Elaboration of the market dynamics that include future prospects, growth limitations and drivers, and trends has been delivered in the chapters subsequent to the overview. These chapters also inundate insights apropos to bottom line of enterprises in detail, along with the fiscal stimulus and the global economy. Forecasts on the global infant clinical nutrition market have also been delivered in chapters propounding a segmentation analysis. The report has categorized the global infant clinical nutrition market on the basis of route of administration, product type, and region. A comparative analysis has been offered on the market segments with regard to year-on-year growth, revenues, and market share. The market numbers relevant to this comparative analysis have also been delivered in these chapters. Regionally, the global market for infant clinical nutrition has been branched into Middle East & Africa, Asia-Pacific excluding Japan, Japan, Europe, Latin America, and North America. A complete package of intelligence on leading participants supporting expansion of the global infant clinical nutrition market has been offered in the concluding chapter of this analytical research report. This chapter elucidates the competition landscape of the global market for infant clinical nutrition, providing information on key strategy implementations of the market players, their product overview, key development, company overview, and key financials. A SWOT analysis on each market players has been provided in this chapter of the report. Additionally, the geographical spread of the market players included, along with their future growth plans, intended mergers & acquisitions, overall revenues, and market shares are elaborated in detail in this chapter. The report has employed an intensity map for portraying key market players located across geographies. Malnutrition in children prevails as a grave concern worldwide. Increasing birth rate coupled with mounting number of premature births has led toward demand for nutrition-rich supplements for young infants. Extremely preterm infants require high nutrition supply that is challenging to meet as growth faltering is common. In adequate growth has further been linked with poor neurodevelopmental outcomes. Although improved early growth in children is associated with good cognitive outcomes, possibility of a trade-off based on worse metabolic outcomes exists. Several new developments have been witnessed in infant clinical nutrition that include recommendations on increasing protein supply, improving lipid formulations, and providing mineral supplements while promoting human milk feeding. Focus of researches carried out on infant clinical nutrition is being directed toward new formula products with potential of improving metabolic and cognitive outcomes. Provision of effective nutrition to infants is being prioritized as an imperative focus of researches associated with neonatal care, with an aim of improving long-term developmental and metabolic outcomes. The National Health Service has recently published standards that mandate screening of all infants for undernutrition post-birth along with periodic examinations. Researchers across the globe are focusing on the development of appropriate nutritional screening tools for children on admission. These tools are likely to facilitate identification of infants who are at high risk of undernutrition as well as those who are undernourished, further benefitting from referral for complete nutritional assessment with the help of a dietician. A recently published Persistence Market Research report has projected the global infant clinical nutrition market to exhibit a splendid growth between the period 2017 and 2026. Worldwide sales of infant clinical nutrition products are estimated to surpass US$ 31,000 Mn in revenues by 2026-end. Revenues from sales of infant clinical nutrition products in Asia-Pacific excluding Japan (APEJ) is set to record an impressive expansion, to account for the largest market revenue share during the forecast period. Robust birth rates coupled with surging prevalence of undernutrition and malnutrition in the region’s child population are major factors contributing to demand for infant clinical nutrition in APEJ. Europe will also remain a remunerative region for growth of the infant clinical nutrition market, with ample availability of various clinical nutrition products, and provision of favorable reimbursements by the healthcare system in the region. Milk-based infant clinical nutrition are likely to remain sought-after among products in the market, with a revenue share significantly larger than that of all the other products combined. This is mainly because of the fact that children consuming various alternatives of nutrition such as soy-based are likely to have relatively lower developmental outcomes as compared to those consuming milk-based products. Although revenue from enteral route of administration for infant clinical nutrition products will increase at a relatively higher CAGR through 2026, revenues from oral administration of infant clinical nutrition will remain the largest in the market. Leading players in the global infant clinical nutrition market are continuously focusing on innovation, with growing consumer requirement for premium quality products that comprise novel ingredients. Regulatory norms mandate sound scientific intelligence for companies launching new product in the market. In addition, the market players are continuously investing in the development of effective and efficient processing methods in their factories for coping with the global rise in demand, meanwhile concentrating on minimizing their environmental footprint. Key participants guiding expansion of the global infant clinical nutrition market include Abbott, Baxter International, Inc., Fresenius Kabi AG, Groupe Danone, Nutricia North America, Mead Johnson Nutrition Company, Meiji Co., Ltd., Nestlé Health Science S.A., B. Braun Melsungen AG, and Claris Lifesciences Ltd.